I’ve just updated the RCG Development Tracker for November – it’s now got almost 800 developments listed, across all property sectors but with a focus on higher density residential. In the last month, we’ve had a bit of media coverage about developments being cancelled. It’s always sad when a project doesn’t proceed, especially for first home buyers who put down deposits, and were looking forward to owning their own home. They’ll get their deposit back, but in the meantime property prices have kept going up, and their plans for moving home are disrupted. Unfortunately, developments being cancelled (or put on hold, or reworked) is not new. No development is a sure thing, and some won’t go ahead, despite the glitzy marketing and the flowery statements from real estate agents. It’s part of a healthy market where some things work and some things don’t. CBRE summed this up well when they said that cancellations boil down to “developers launching the wrong project, at the wrong place, at the wrong price”. I’d add “wrong time” to that list – some projects might have worked if they’d been a bit earlier or a bit later – but it underscores that projects can fall over if they don’t have all the right ingredients. Going back to 2014, there was “Xanadu”, which adopted the unusual marketing technique of being an over-50s complex. A new developer took over, and put together new plans for the site, now known as Union Green. There are also cases where the developer has had to take a more cautious approach – scaling back their plans, or pulling a project off the market to wait for a better time. Some examples are 88 Broadway and Orakei Bay Village, both by Equinox Group. At 88 Broadway, Equinox was planning to demolish the existing building on Broadway for a large master-planned development. They then decided to retain the building instead, and have refurbished it for offices and retail. At some point, new plans will presumably emerge for the rest of the site. 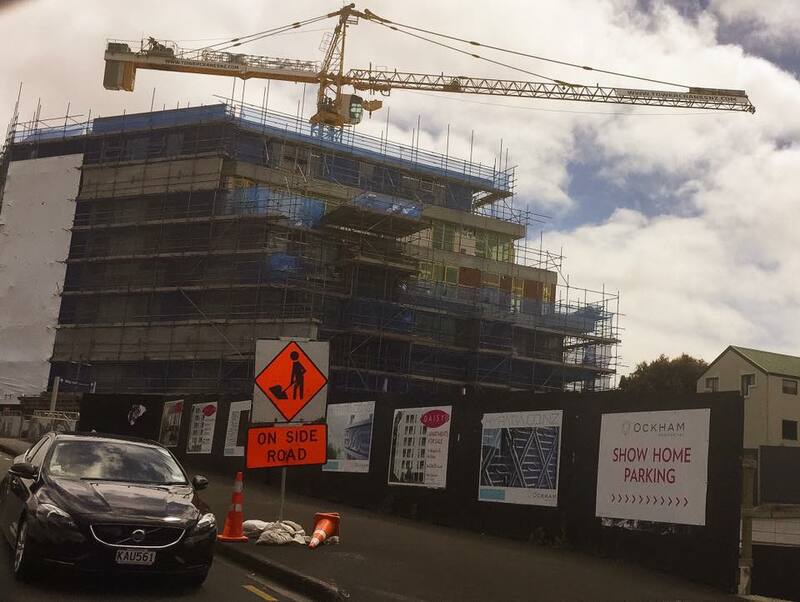 At Orakei Bay Village, apartment plans have been put on hold for now, and some old buildings are being refurbished for retail tenants. Putting some work into existing buildings is a lower cost, lower risk development option. It’s like a mild form of land banking: the developer gets a bit of a return off the property, but in the long term they’ll expect to demolish the buildings and put something more substantial there. Ponsonby Central and City Works Depot are also examples of this. But it’s not all doom and gloom, far from it. New housing projects keep getting announced, and there will be many more to come. Like the ones that came before, developers (and buyers) will have to take their chances as to what goes ahead and what doesn’t. In many cases, the new launches show the Special Housing Area programme finally bearing fruit – projects like Fabric Of Onehunga, The Victor (Browns Bay) and Station 580 (Kingsland) are all SHAs. They join a large number of SHA projects which are already on the market, with some under construction. We’re seeing the first signs of construction on other projects, too. This often starts small, by demolishing existing buildings or doing some earthworks. There’s also a large number of projects which are well underway, unremarked by the media but well covered in places like Skyscrapercity, where builders just keep plugging away towards the eventual completion. As another sign of what’s coming up, here are the latest figures for building consents. The middle of the year was quite flat (i.e. no growth in consents vs 2015), but that’s coming back up again now. In total, 9,960 homes were consented in Auckland in the last 12 months. 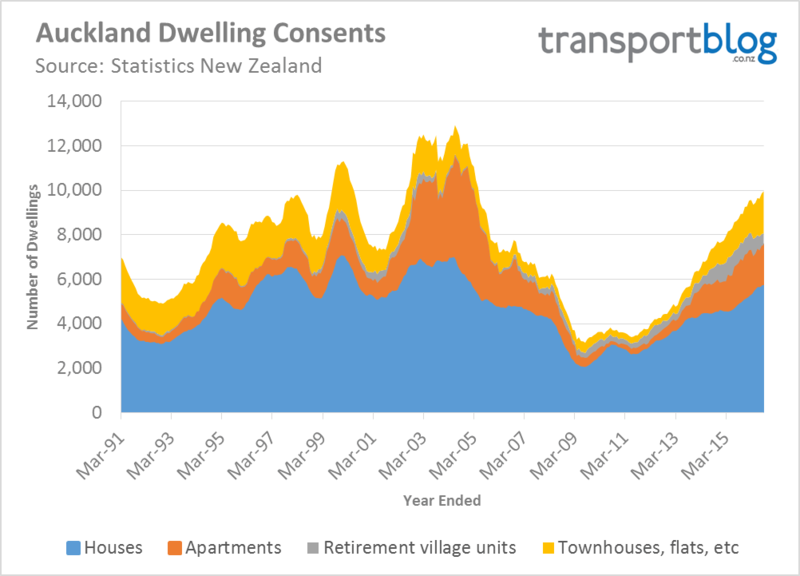 That annual figure should hit 10,000 for 2016 – a bit of a benchmark, and also one of the targets in the Auckland Plan. Do you know what is going in on 30 Barrack Rd, Mt Wellington (or how does one find out in general)? Do you mean 12-26 Barrack Road? Greenside apartments with 121 dwellings. Anyone got any development with the Big Luxury apartment supposed to be built in Manukau opposite Rainbows End? Building luxury apartments in low social-economic areas with no public prestige school simply doesn’t work. I bet that project will fail. Remember land cost is only 10% of the a typical apartment project, 90% else is consent, construction, funding interest and sales cost. So why developer save little on land to build something that doesn’t sell or doesn’t make good enough profit? Thats why a lot of luxury apartment project in Mt Eden, Epson, Remuera, Milford and Takapuna works. And thats why we also see many apartments in poor school zone failed: Otahuhu (The Richmond Mews), Mt Wellington (Springpark), Avondale (Flo). 2. Build tiny apartments in city that is walkable to university and office. Of course unfortunately there are also the cases of developers “cancelling” projects under other guises simply so that they can sell them later for a much higher price (effectively land banking). Perhaps the market needs to be regulated more around the sunset clauses. Buyers could be offered a premium of say 5% at time of deposit to guarantee they won’t face cost escalations down the track or risk it without the 5% (of course this doesn’t work if the developer just cancels the project). It would force developers to be more honest and to be more careful with keeping their costs in check. The Albany Rose example is quite simply developer greed – different story if prior to construction they find their costs will be more but not when the building is half complete and asking for an additional 15%! – We all know that they will be quite happy for the buyer to cancel their contract because they can then sell the apartment for more money to someone else. There could almost be a case made for prosecution under the Fair Trading Act for false advertising since they intended to charge more all along and baited buyers with underpriced offers. I have never understood the developer bashing that goes on in New Zealand. We don’t do this for anyone else who derives profit from the provision of essential goods. Add to that rampant price inflation (Someone must be making money of this! and some definitely are!) and then some really, really bad examples like leaky homes and Nelson Street mass-market apartments or cookie-cutter mini-suburbias with 300 identical houses, and you got enough in the stew to make developers the evil folks. All of those things apply to so many other industries though. Try telling that to bankers. Fair point, though I will note that only one of those two groups have committed criminal fraud that resulted in the collapse of the global economy in the last 10 years. Anyone know what has happened to Anzac lofts in Browns bay? Looks like the land is up for sale again. I’m guessing the owners’ plans have changed, as it’s only part of the site which is up for sale – but it seems like Anzac Lofts aren’t being marketed any more. I’ll shift them to “On hold”. @Sailor Boy: I think there are a few things that people dislike about developers (some justified, some not). As Damien pointed out some people don’t like change – NIMBY etc. That isn’t my issue. My issue with them is that as you pointed out it is essential goods – as in people need them rather than want them and they are sick of developers creaming it at everyone else’s expense. Sure they should make a profit and a decent one at that – however some of them really take the piss. Yes land in Auckland is expensive. Yes materials in Auckland are expensive. Yes permits/consents/inspections etc are expensive (all of these are separate issues that do need to be addressed). Those things alone don’t explain why a large apartment complex on the outskirts of the city (Albany Rose for example) on bare land that already has infrastructure in place costs $500k for a 1 bedroom apartment (no view to write home about either)! Then for the developer to come back and ask for an additional 15%! Back of envelope (borrowing one of your sayings) would suggest that these realistically cost around $370k and possibly $400k at a push if additional expenses came up and if it had a very high standard of fittings etc – which these have a decent but nothing special level of fittings. That means that the developer is making in the region of $100k-$130k per apartment (this will be an 800 apartment development with many larger units too). Even if by some miracle costs had really blown out so much, to ask for a further 15% ($75k) is absurd! Between materials and developer profit margins and a bit less red tape between those that would be enough to pull back building costs easily by 10%. Please show me the back of your envelope. I think government should propose a standard sunset clause with cancellation penalty, ideally the penalty equals to the potential capital gain from the date of deposit to the date of cancellation. 1. For project that doesn’t sell well, developer mucking around waiting for more buyers is heavily punished if the project do eventually cancelled. So developer will be more decisive and cancel the project to cut loss quickly. – That makes people who put down deposit move on quickly, instead of wasting a couple years of everybody time. 2. For project that are attractive, since buyer knows they will get the capital gain back, interested buyers will not hold back and wait, they all rush to be the first buyer to secure the best unit – so the project will sell out very fast. Because the project sell out much faster, the developer can start construct sooner rather than later, which saves construction cost and reduce risk.